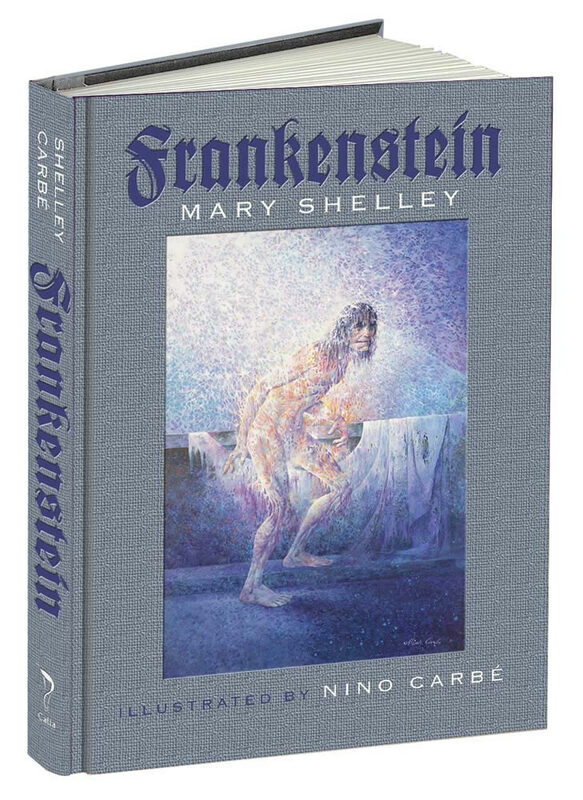 Having read Mary Shelley’s Frankenstein on more than a single occasion, revisiting the tale in its entirety didn’t feel much like a necessity. Just the same, when you’re holding a story like this in your hands, it’s hard to put it down. This is one of the most famous and adored works of fiction that history has ever produced. The name – Mary Shelley – holds a resonating ring with every ardent genre follower on the map. The story has been retold in countless different ways through a number of differing entertainment mediums. It doesn’t get much more adored than good old Frankenstein, which has found an entirely different life within the realm of celluloid. The story never ceases to amaze, having now transfixed generation after generation. It’s a brilliant work. Dover Publications imprint, Calla Editions recently rolled out a rich, beautiful edition of the tale. Hardcover and including Nino Carbe’s haunting imagery, the quality of the book reminds us how thick, powerful and fulfilling paper can be. There’s an interesting connection and magic generated between the pages we turn – especially in such a stunning package – and the flesh on our fingers. It sends a real charge through the imagination. Somehow, it changes things. It’s just a bit of a bummer that what once was the norm is now an atypical enough product to summon early onset nostalgia. Kindles and eReaders have taken over the market. Publishing houses are chopping costs by releasing digitally as opposed to going the old hard copy route. Sure, that’s convenient, sure you’re saving a little change with every page not printed… but if you’re a true book lover, you know there’s no comparing holding a paperback and a piece of plastic. Reading a crisp, clean hardcover will always be a personal preference. I read enough articles online – I don’t want to read my novels on my laptop now as well. That’s where treats like this come welcomed and appreciated. Dover’s done something lovely with Shelley’s timeless work. There’s a freshness to this release that, perhaps, shouldn’t even exist (the story’s been around forever). But it does. And I loved thumbing through it all. Shelley’s ability to intertwine human emotions borders on eerie. And that has a very real effect on the reader, who’s left constantly bouncing between moral examinations and experimentation, knowing the hint of a true superiority complex and the realization that arrogance can run away with more than a man’s mind. Mary Shelley was a special talent, and a visionary in every sense of the word. Dover hits a homerun with this slick edition, packed with Nino Carbe’s wonderful artwork and a brand new foreward, written by his daughter, Elizabeth Carbé. Frankenstein has never looked so beautiful. I’d strangle a special needs kid for that book: such a beautiful cover that is. I appreciate what you’d said about real books versus ebooks. I buy them, first, for the art (cover) — then I buy them for the story. Maybe I crap out on the latter but the former is enough to sustain me.